From the start of the title track on Dare Seize the Fire, Daydream Vacation has one mission for you – get up and dance! The duo consists of Dave Einmo from Head Like A Kite handling the music and producing, and Asya de Saavedra from Smoosh singing in a lovely, ethereal voice. On “Feeling Like I’m Floating,” Asya is joined by a male vocalist and the mix of voices is just right for the song. “Get Up on Your Feet” has a very funky sound, more reminiscent of the ‘70s than now, and “Kitchy Koo” is a cute, poppy song about pillow fights. “Reincarnation” is the one song on the album where they slow things down, and it’s a pretty song backed mostly by piano rather than synthesizers. 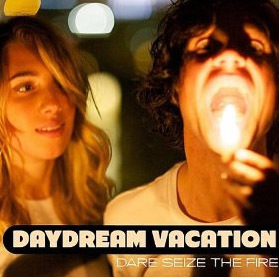 It’s an interesting contrast to the rest of Dare Seize the Fire, but shows that Daydream Vacation has range – and that they know that sometimes, you just need a slow dance.